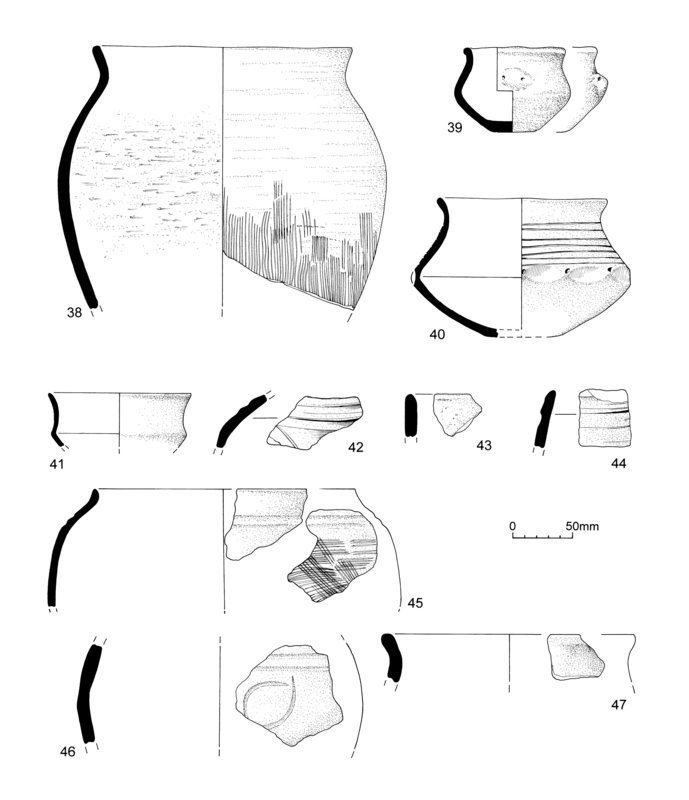 A total of 6.83kg (366 sherds) of Early Saxon pottery was recovered from sixty-eight contexts in all. The most significant assemblage came from deposits representing the infill of a Saxon re-cut (14529) of Roman well 14984. In particular, three contexts (14528, 14558, 14613) between them produced c. 2kg of pottery (30% of the total recovered from all excavated features). Other contexts producing Early Saxon pottery comprised the fills of sunken-featured buildings, pits, post-holes and the upper levels of Roman ditches. Saxon pottery was also intrusive in small quantities in some of the prehistoric and mid-Roman features. Late Roman features producing both latest Roman and Early Saxon pottery were looked at in some detail in order to define the inter-relationship between the two groups. The Saxon features present themselves as a scattering across the site with two obviously cohesive groups forming a cluster around sunken-featured buildings (Buildings 67-9), which perhaps represent a focus of activity during the Early Saxon period. The nature of the Saxon settlement is problematic; but, as on other Essex sites, it may be that many of the shallower remains have been removed leaving only the deep features (the wells and large ditches) and a random scatter of the shallower features to tell the story of the Early Saxon settlement. 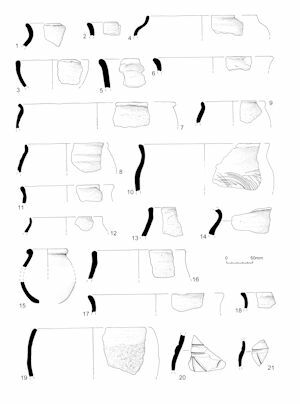 This report presents a catalogue of the diagnostic elements of the pottery assemblage, followed by a discussion of the date range of the pottery and its inter-relationship with the latest Roman material. Full details of quantification by context, sherd count, weight and fabric can be found in the archive. Seven fabric groups have been discerned (some subdivided) and these are detailed below. Fabric 1:	A small quantity of pottery (8g), found in only three contexts, exhibits no added tempering. It was made from the local brickearth, which incorporated common small inclusions of micaceous quartz-sand. Fabric 2a:	This is the predominant fabric (4.85kg) and was found in sixty-three contexts. This fabric is hard to medium-hard and has abundant small to medium quartz-sand with a varying amount of mica present. It is difficult to assess how much sand occurs naturally in the clay and how much was deliberately added as a tempering agent. Diagnostic forms in this fabric are represented by nos 1, 2, 4-13, 15-18, 21-31, 33-41, 45 and 47. Fabric 2b:	A variant on the sandy ware (Fabric 2a) which has a moderate amount of haematite present; this generally gives a slightly softer fabric. A small amount (73g) came from four contexts. Fabric 2c:	This sandy ware is differentiated by the application of a slip containing large particles of quartz-sand on the outer surface of the vessel, referred to as schlickung. This is seen as an indicator of an early 5th century date. It occurred in six contexts, total weight 176g. Fabric 3a:	Organic-tempered with abundant temper, resulting in many voids in the surfaces. A softer, more friable, fabric than Fabric 3b. A comparatively small amount (463g) occurred in fifteen contexts, three of which are diagnostic forms, nos 14, 20 and 46. Fabric 3b:	Medium-soft to medium-hard fabric with sparse organic temper. A small amount (73g) was recovered from four contexts. Fabric 4a:	A medium-hard to hard fabric with sparse to common finely chopped organic temper and sparse to common small to medium quartz-sand. It is difficult to ascertain whether the sand is a deliberately added tempering agent along with the organic matter. It may simply occur naturally in the clay source. A total of 76g was recovered from seven contexts. Fabric 4b:	A medium-hard to hard fabric with sparse to common haematite in addition to quartz-sand and organic temper of Fabric 4a. A single context, pit fill 15862, produced 42g, including two diagnostic sherds, nos 43 and 44. Fabric 5a:	A fairly substantial amount (490g) of pottery from six contexts has a vesicular appearance; in addition to a common to abundant amount of quartz-sand, it is tempered with small chalk particles that have leached out on the surfaces. Pit fill 14613 produced a diagnostic rim, no. 32. Fabric 5b:	As Fabric 5a, but with sparse to common haematite in addition to quartz-sand and chalk. It occurred in two contexts, with a total weight of 16g. Fabric 5c:	A variant of Fabric 5a has chalk temper and an outer surface with schlickung. It is present in fairly small amounts (148g) in only two contexts, pit fill 14528 producing a diagnostic bowl, no. 19. Fabric 6:	A few sherds (207g) from three contexts have common to sparse grog temper, usually alongside some quartz-sand. Fabric 7a:	A small amount (172g), which, in addition to quartz-sand, has some shell in the fabric. This may be an intentionally added temper or it may occur naturally in the clay source. Pit fill 15862 produced a decorated sherd in this fabric, no. 42. Fabric 7b:	As Fabric 7a but with surfaces treated with schlickung. It is found in only one context, pit fill 14528 (weight 21g). 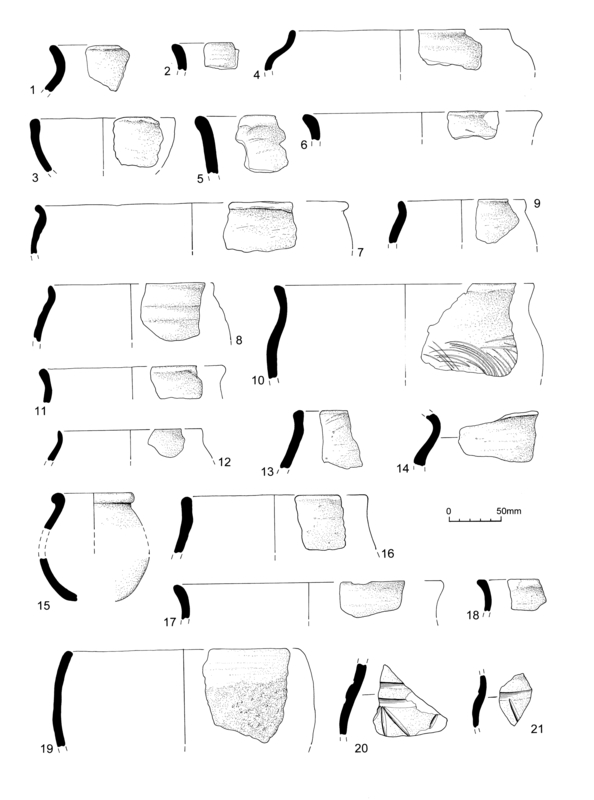 The following catalogue comprises the diagnostic sherds, ordered by context. Each entry in the catalogue is taken as a separate 'vessel', although instances occur where variations in fabric composition among several entries are minimal and it is conceivable that they do in fact represent one vessel. The assemblage contains several elements that are typical of a late 5th century group; the decoration is simple, typically incised concentric necklines with further incised schemes below (nos 20, 21, 35, 42). Where stamped decoration does occur it is of the simplest design, Briscoe's A1 or single circle motif (no. 27). The most common forms include hollow-necked globular and biconical jars (nos 10, 22, 29, 31) and globular bowls with upright or slightly everted rims (nos 19, 24, 30). Two examples of straight-sided bowls (nos 32 and 43) are atypical of the group. A single faceted, carinated bowl (no. 40) can be dated to the late 5th century. All the previously mentioned pottery forms are commonly found on Early Saxon settlement sites of 5th to 6th century date. However, at Elms Farm three vessels stand out as unusual. Two vessels are wheel-thrown with deeply corrugated surfaces; the squat globular jar from cleaning layer 9720 (no. 8) and a body sherd from well fill 12246. The squat globular jar could be a Frankish import as it resembles examples of Frankish jars found in Essex at the 6th-century cemetery site at Prittlewell, Southend (Tyler 1988, 91-116), and the body sherd could be from a similar vessel. The third oddity is a small jar with rolled-over rim from ditch fill 12059 (no. 15). It does not resemble Frankish forms and is the best candidate for a Saxon imitation of a Roman jar, perhaps a hybrid 'Romano-Saxon' form. Surface decoration is consistent with the late 5th century date range. Deliberate roughening of the surface by the application of a slip containing large quartzite particles - schlickung - is common (no. 19). Burnishing (both inner and outer surfaces) is also common. Finger-rustication does occur, but only in small quantities, whereas combing is comparatively common (nos 10, 23, 38, 45). 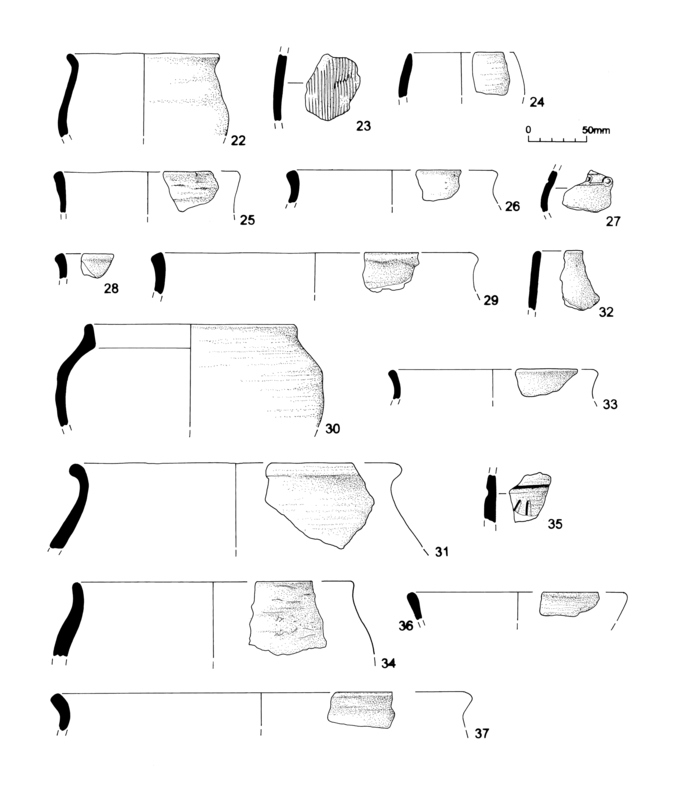 The dating implications of the surface treatments listed above have been analysed by Hamerow (1993) in her discussion of the dating of the Early Saxon pottery from excavations at Mucking, Thurrock. The most obvious dating indicator from the distribution of the various surface treatments is the pattern of occurrence of the sherds with schlickung, which were found in the earliest (5th to early 6th century) areas of settlement. This is a key group in understanding the Late Roman/Early Saxon transition. The group has characteristics typical of a late 5th century assemblage; the decoration is simple, typically incised concentric necklines with further incised schemes below (nos 20, 21, 35). Forms include hollow-necked globular and biconical jars (nos 20-2, 25, 31, 33-4) and globular bowls (no. 19). Surface decoration includes deliberate roughening of the surface by the application of a slip containing large quartzite particles (schlickung), burnishing (both inner and outer surfaces) and finger-rustication (the latter only in small quantities). All these characteristics are typical of a late 5th century assemblage. The pottery from the wood-lined ditch is, with one notable exception, typical of a 5th century assemblage, in the main comprising undecorated hollow-necked jars, mostly in Fabric 2a (tempered with quartz-sand and including some mica). However, the exceptional vessel is a small jar (no. 15) that appears to be a Saxon copy of a Roman form; the rim appears to be rolled over and is surely wheel-thrown with a minimal neck hollow. Although the vessel is far from complete, three sherds survive, one of which (a lower body sherd) does not join with the other two. Enough of the vessel survives to reconstruct its profile; a small jar-shaped ?drinking vessel with a sagging base. This form is unusual in the Early Saxon pottery repertoire and is, I believe, a very strong candidate for a hybrid vessel. The pottery from this feature (total weight 161g) is utilitarian in form, with rather crudely made globular jars and bowls in the sand-tempered Fabric 2a, which is the predominant Early Saxon fabric from the site. The large high-shouldered jar (no. 4) is most likely a cooking pot. There is nothing exceptional in this group: it is a typical assemblage for a 5th to 6th century sunken-featured building. The range of pottery forms can be paralleled on many Early Saxon settlement sites, and many can be found in the Mucking volume (Hamerow 1993). Fill 15694 of a short, curving and enigmatic Saxon ditch contained a complete carinated bowl with a perforated lug (no. 39), but no other pottery in this fill, Saxon or otherwise. This vessel appeared to have been set in an upright position on the floor of the gully before infilling, which suggests deliberate or structured deposition. The Saxon re-cut, 14529, of Roman well 14984 contained by far the largest assemblage of Early Saxon pottery. The stratigraphic relationship between the Early Saxon material in this feature and the latest Roman material is discussed in the section on Roman pottery and need not be repeated here. However, it should be stressed that the comparatively large amount of Early Saxon pottery shows this feature to have been in use during the late 5th and most probably through into the early 6th century, indicating a break between Roman and Saxon occupations. The practice of Early Saxon reuse of late Roman features, in particular deeply cut features such as wells, has been noted on other settlement sites with both Late Roman and Early Saxon occupation, but in most cases it is difficult to prove anything other than reuse following a break. On several excavated sites in the county well-groups account for the bulk of the recovered pottery of Early Saxon date; these wells can be of Saxon construction or are Saxon re-cuts of Roman features. For example at Slough House Farm (Wallis 1998, 57; Tyler 1998, 157-8) nearly all of the 2.4kg of Saxon pottery recovered came from the fills of two wood-lined wells of Early Saxon date. Excavations adjacent to Elms Farm at Langford Road in 1994 recovered some 1.38kg of Early Saxon pottery, most (1.2kg) from the final infilling of a Roman well (Langton and Holbrook 1997, 29). This is close enough to Elms Farm to be considered as part of the same settlement; the excavators at Langford Road found no evidence of Saxon structures, indicating that the main settlement focus was probably towards the east, at Crescent Road (Drury and Wickenden 1982). In this connection, it is worth noting that two clusters of features containing Saxon pottery, centred on Building 69 in Area W and Buildings 67 and 68 in Area R, are in relatively close proximity to the sunken-featured buildings uncovered at Crescent Road and to further Saxon remains identified immediately adjacent to this in 2002 (Roy 2003). The date of the Elms Farm Early Saxon pottery assemblage supports the argument for a site-wide break in occupation during the first half of the 5th century, contra Drury and Wickenden (1982, 31). 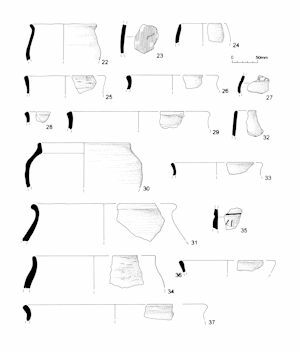 The research archive contains a study on sherd brokenness and the association of pottery types within a range of deposits. The average sherd weights, percentage EVE and percentage weights for selected Late Roman and Saxon assemblages were tabulated for comparative purposes. The exercise was repeated for other site assemblages, for which investigations of a similar nature have been attempted. The study has produced interesting results that would appear to confirm the proposed break in occupation at Elms Farm, and has gone some way towards establishing pottery deposition patterns during the late 4th and 5th centuries.